Sweet Potato Rosti is here to brighten up your breakfast time. Top this cheesy golden rosti with eggs and avocado for a delicious cafe-style brekky without the hefty price tag! I wholeheartedly believe that breakfast is better when potatoes are involved. Crispy Breakfast Potatoes are a favourite in our house. Nestled alongside some eggs and bacon, you’ve got yourself the most perfect breakfast. But while regular potatoes are great and all, the sweet potato has my heart in a HUGE way. And I knew I had to try and find a way to incorporate it into a breakfast dish. Enter the Sweet Potato Rosti. I’ve seen rosti’s made in two different ways – just potato and butter, and just potato and eggs. I’m all on board for the potato and butter option, but the potato and eggs end up tasting just a little too eggy for my liking. I decided to try and mix mine up a little by making them more like a fritter. I included some haloumi to act as both a binder for the rosti and to elevate the taste (fried cheese always wins). And the result was DELICIOUS. You can serve these rosti’s as is or my favourite – top them with some mashed avocado, egg and even some bacon. Breakfast heaven! 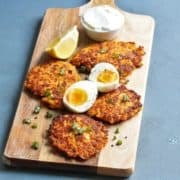 And just a quick word of advice – you will be left with some unused haloumi after making these rosti’s (you only need half a standard block) and you should DEFINITELY use it to make these Zucchini and Haloumi Fritters for dinner. They are AMAZING and you won’t be sorry. Whole-Wheat / Wholemeal Flour – OR you can use white all purpose flour or almond flour if you’d prefer. 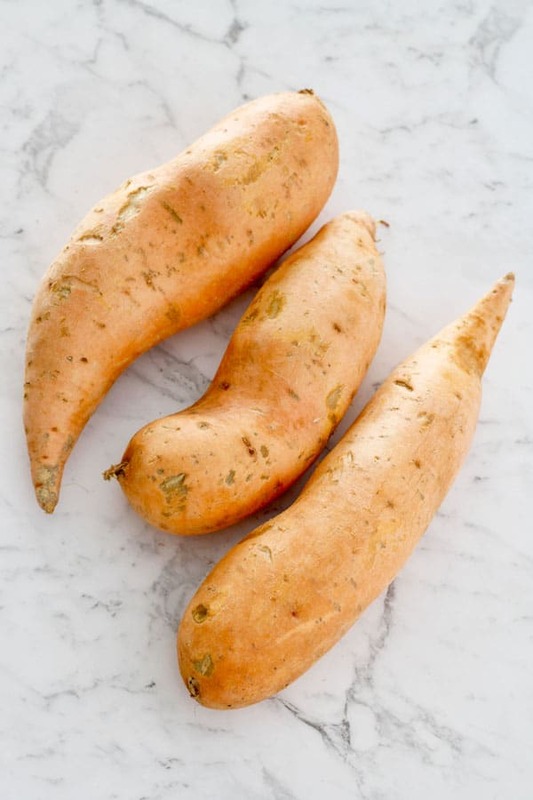 SWEET POTATOES – SKIN ON OR OFF? 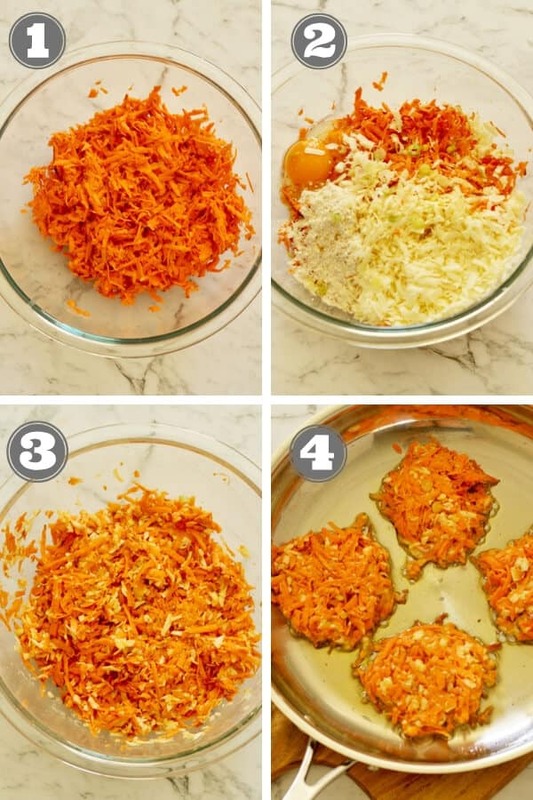 Whether you peel your sweet potato before grating it for the rosti is up to you. I personally almost always leave the skin on when cooking with sweet potatoes. The skins of sweet potatoes contain a number of additional nutrients and vitamins, including fibre, beta carotene and vitamin C & E. They are 100% safe to eat, you just need to ensure you wash and scrub them well first to remove any dirt. Squeeze as much moisture from the sweet potato as possible. I find the easiest way to do this is to scoop up by the handful and squeeze over the sink, then pop into a clean mixing bowl (photo 1). Add spring onions, haloumi, egg, flour, garlic powder and cumin to the mixing bowl, and mix well to combine (photos 2-3). Heat oil in frying pan on medium heat. Place a tablespoon or so of the rosti mixture in the pan and flatten with the back of the spatula. Repeat with the remaining mixture, cooking in batches without overcrowding the pan. Cook for 2-3 minutes each side until golden and crispy. Transfer to a plate lined with paper towel (photo 4). 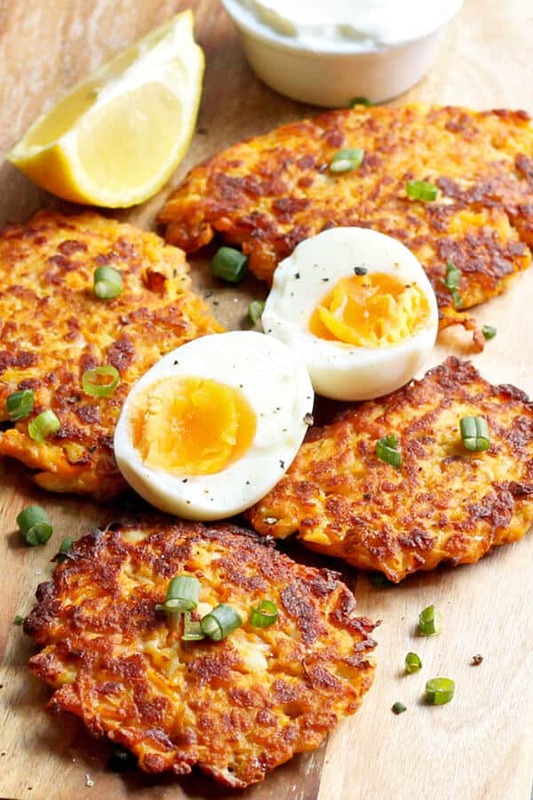 Rosti are similar to fritters and are at their best when eaten straight away when they are crisp and golden. They are still delicious when reheated, but they often lose that crispiness and become a little softer. This has never bothered me, and I regularly eat my leftovers over the next few days and thoroughly enjoy them regardless of if they are as crisp or not. Store rosti in an airtight container in the fridge for up to 3 days. Individually wrap rosti in cling wrap / plastic film, then pop in an airtight container or freezer bag and store for up to 1 month. Thaw overnight in the fridge when you’re ready to use and follow the reheat instructions below. Heat oven to 180C / 350F. Pop rosti on a baking tray lined with baking paper or a silicon mat, and place tray in the oven for 10 minutes, or until rosti is heated all the way through. You can reheat in the microwave, although, I find this method makes the rosti soft and soggy and I don’t recommend it. Make sure your squeeze the excess moisture out of the sweet potato. This step helps avoid sogginess. If you find the mixture is too wet and not holding, add in a teaspoon of flour and mix again. Continue, if necessary, until you reach your desired consistency. You need enough oil to just cover the bottom of your frying pan. Make sure it’s hot before popping the rosti into the pan. Cold oil will absorb into the rosti and make them soggy. Cook the rosti in batches, about 3-4 at a time so you don’t overcrowd your pan. 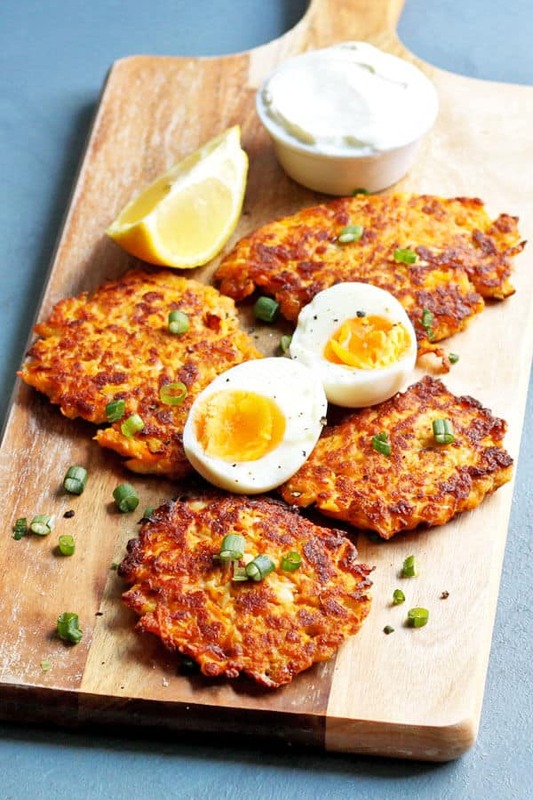 If you’ve tried these Sweet Potato Rosti I’d love to hear how you enjoyed them! Pop a comment and a star rating below! You can also FOLLOW ME on FACEBOOK, INSTAGRAM and PINTEREST to keep up to date with more delicious recipes. Sweet Potato Rosti is here to brighten up your breakfast time. Top with eggs and avocado for a delicious cafe-style brekky without the hefty price tag! Squeeze as much moisture from the sweet potato as possible. I find the easiest way to do this is to scoop up by the handful and squeeze over the sink, then pop into a clean mixing bowl. Add spring onions, haloumi, egg, flour, garlic powder and cumin to the mixing bowl, and mix well to combine. Heat oil in frying pan on medium heat. Place a tablespoon or so of the rosti mixture in the pan and flatten with the back of the spatula. Repeat with the remaining mixture, cooking in batches without overcrowding the pan. Cook for 2-3 minutes each side until golden and crispy. Transfer to a plate lined with paper towel. Serve on their own, or top with eggs and avocado for a delicious cafe style breakfast. Whole-Wheat / Wholemeal Flour - You can use white all purpose flour or almond flour if you'd prefer. Olive Oil - You can use coconut oil, or another frying oil, if you'd prefer. SWEET POTATO - Grate with or without the skin - it's up to you! If you're leaving the skin on, make sure you give it a good wash first. EXCESS MOISTURE - Make sure your squeeze the excess moisture out of the sweet potato. This step helps avoid sogginess. COMBINING THE MIXTURE - If you find the mixture is too wet and not holding, add in a teaspoon of flour and mix again. Continue, if necessary, until you reach your desired consistency. COOKING ROSTI - You need enough oil to just cover the bottom of your frying pan. Make sure it's hot before popping the rosti into the pan. Cold oil will absorb into the rosti and make them soggy. COOKING IN BATCHES - Cook the rosti in batches, about 3-4 at a time so you don't overcrowd your pan. STORING - Pop leftovers in an airtight container in the fridge for 3 days OR individually wrap in cling wrap / plastic film and place in airtight container or freezer bag in the freezer for a month. Thaw rosti in the fridge overnight when ready to use. REHEATING - Preheat oven to 180C / 350F, place rosti on a baking tray lined with baking paper / silicon mat and pop in oven for 10 minutes or until the rosti is heated all the way through. UPDATES - First Published August 28, 2018. Last Updated March 18, 2019 – no changes to the recipe, just updated with more photos, tips and tricks. NUTRITION - Nutrition information is a rough estimate based on one rosti.